Just back from a fun week at Lake Pillsbury with family and friends. 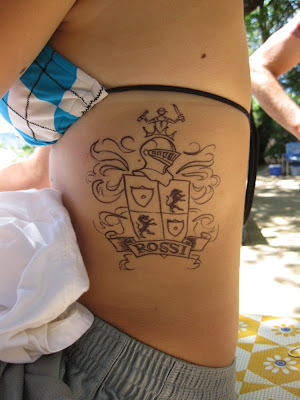 Last year I brought my black sharpie to the lake to ink a few campers. This year, I brought out the big guns: COLOR Sharpies in two tip sizes, books of hand lettering and tattoo flash images for visual reference and a couple of clip art books. There was something for everyone. Who knew Sharpies could be so fun. 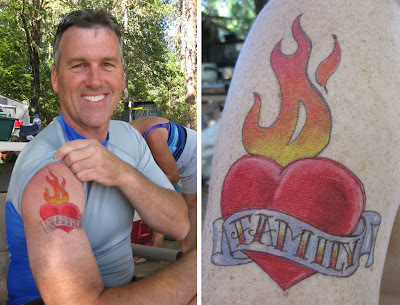 Jeff’s FAMILY tattoo, what a cutie! Drawn in color first, then outlined in black fine-point. The Led Zeppelin angel from T-shirt reference. I’m not the best with drawing the human figure, so I sketched with a light grey pen to start. 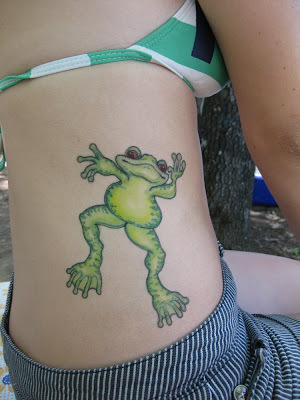 Froggy tat from black & white clip art reference. Another FAMILY tattoo for this little princess. Faux henna work with a brown sharpie. A young man’s family rose design. His little sister’s flower of choice. A tribal dragon from tattoo flash design reference. When the star faded, a family crest design taken from a tiny gold pendant she wears. 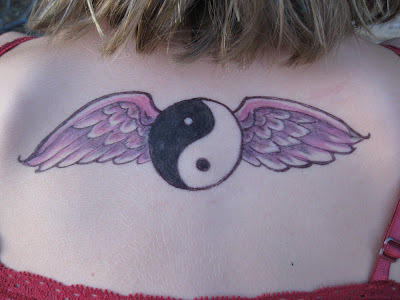 Sarah’s custom design of choice, a yin yang with pink wings. 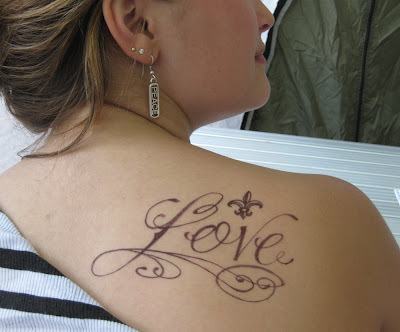 Love script with a fleur de lis, her favorite symbol. 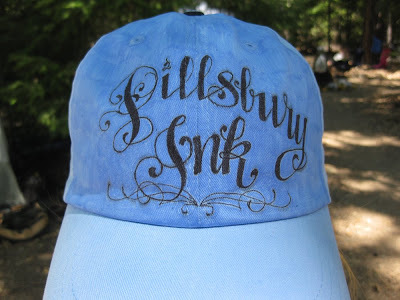 Even my cheap blue ball cap was tattood! 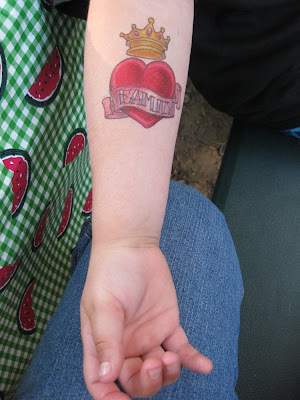 This entry was posted in Uncategorized and tagged Sharpie Pens, Sharpie Tattoos. Bookmark the permalink. Who knew that sharpies could be this much fun! All of them are adorable. WoW – major display of your talent!! How fun!!! Holy cow, you are super talented!!! Those are great! You are gonna put us out of business!! AWESOME! They look so realistic! I want one now! Goodness! The art work is lovely! Now if someone is not sure about getting a tattoo then to get a temporary one is such a GREAT idea. I want to try it just for the arts sake. However, at my age it seems like such a huge step. Thanks for sharing this idea with us. I cannot imagine how steady your hand must be – and skin is not even and steady. Amazing. Those are amazing! You are very talented! Awesome, you are super talented!! what a versatile artist you are! Hope you had a great vacation – it looks like you did – these are excellent. I especially love the flourish 'LOVE' design and the frog. Thanks for sharing Cathe! What a great idea! Looks like a lot of fun. Love it. You are awfully good with a sharpie!! Are you sure those aren't real?? They are amazing…you are talented, my bloggy friend. Really extraordinary work, how fun can sharpies be! Wow!! i think i just fell in love with sharpies! didn't know they can be used like that. awesome designs! Love that idea. 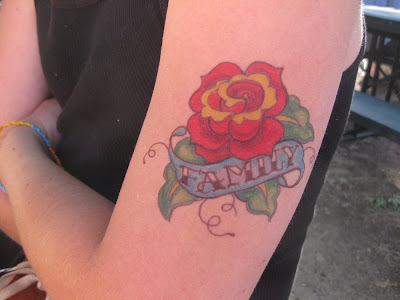 Do you think the parents at our upcoming block party would have a problem with me tatooing their kids with permanent marker??? Omg! I love these!! So talented!! Now that is cool! 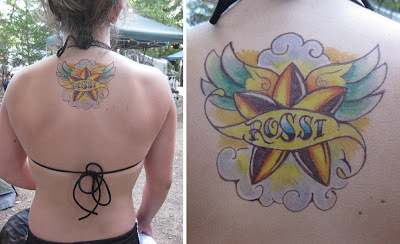 I must admit, I never would have thought to do temporary tattoos with sharpies. Nonetheless, I may have to try it! Make a note: When I come to visit I want a Sharpie tatoo! Those are awesome! You did great! Gotta love sharpies! Color me impressed! I have fantasies about being able to draw. I draw stick people, badly. What a fun way to pass the time on a camping trip! 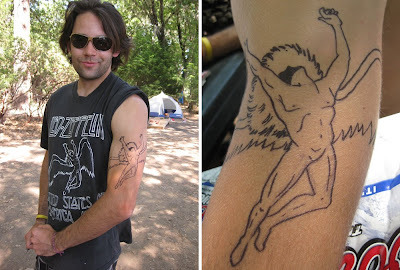 You rock on so many levels with this Sharpie tatoo thing I cannot even begin to wrap my brain around it! And since I'd never get a real tatoo, a sharpie one is right up my alley! I really like this idea and what a fun time for everyone. I esp. liked the love "tat" since I just came back from NOLA and those fluers (hope I spelled that right) are everywhere. Awesome! Thanks for sharing! Love, love, love them! How long do they last? Just to give you an idea of what I am talking about. I have also worked with an artist who paints with acrylic on canvas and then I sew it into a bag. holy cow that must have taken you all weekend! you are very talented with a sharpie 🙂 that henna tattoo is amazing!!! There is some really great art there. Holy smokes – those are amazing!!! Super cool. Looking for my Sharpies so I can draw a ladybug on my toe . . .
Super cool! You are very talented. I just had my tattoo artist husband check out your work, and even he was impressed! Not bad for fun with some sharpies by the lake! I love that you showed the pics! It's too bad they're only "temporary". Good thing you took photos! I love, love, love Sharpies! These are beautiful! What talent! Love that! They look like actual ink needle tattoos! Bet it was fun for you and all who got to wear a tat! Great Job! Hope you keep showing us more! Wow can I go camping with you! What fun, you are so talented, I can hardly stand it! Perhaps you would like to share your photos there too? Who knew there was a whole community of Sharpie lovers??!! These are awesome! What a fun thing to do with a group. 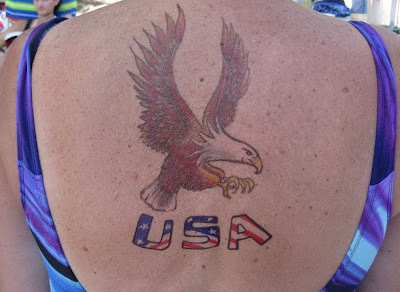 I had a friend who used to give me small "tatoos" with a sharpie, but nothing like this! Great job! OMG what fun!!! Those all look FANTASTIC! 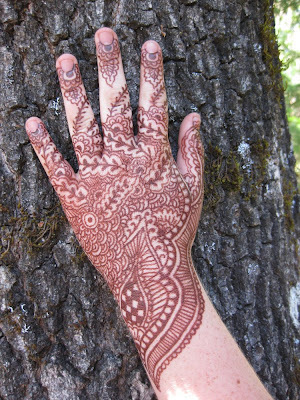 This is fabulous….I especially love the henna hand…you are do clever!! Wow, those all look so good! And you did that free hand, super impressive. You are awesome, this looks like so much fun!! Wow, wow, wow!!! Love them all and so nice to know there not permanent until your 80 years old!! why didn't you guys grab the rv? Absolutely amazing! I'm not a big fan of permanent tattoos, but these are extraordinary, and the amazing thing is that you can keep photos of them forever, but the image will wear off with time. Did you draw all of those—you are a gifted artist! Beautiful . . . I think you should open a business. What a great way to decide if you really want the permanent tatoo… before you get it! You are so awesome! How fun, Sharpie tatoos. You are super talented. These are amazing! I want a Sharpie tattoo!!! What a great idea! Your work is GORGEOUS! How long do they last? 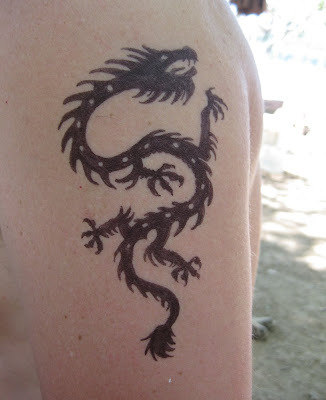 I'm too chicken to get a real tattoo, but I'd totally love to have a sharpie tattoo for a little while. Great works of art! You have a great talent. Wow! That is awesome fun! I love the henna! You got a gift girl, I hear tattoo artist can make some cash! Sharpies are so great! I love getting color sharpies and creating peices of art with the kiddos. They really are the best for creating crafty things on the fly. Thanks for visiting the forums over at SantaRosaMom.com. I hope to hear from you more, and I can't wait to read more of your blog! You HAVE to send me a photo of your Love tattoo!!! You HAVE to! What a great idea this is for a family outting. If I could draw I would do this for our family get together. While the work is nice, Sharpies are by NO MEANS meant to go on the skin. This is very dangerous and toxic. 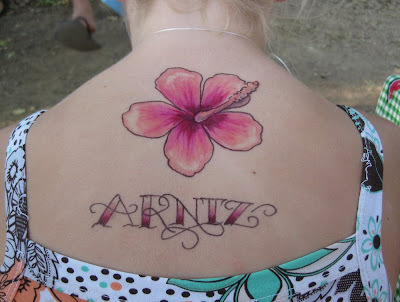 Please invest in some temporary tattoo ink products, or at the least, some proper face and body paints! What can I say WOW!!!!!!!!!!!!!! GREAT…..